It's a bit dreary out today, but sunny days on the way. I recently spent some time falling-up our front porch, and the things I've done are so simple! Anyone can do this, and everyone can enjoy the results, rain or shine. I started by hanging my favorite fall wreath on the front door. Mine is from Saraboo Creek in Naperville, if you're local. Then I added that cute little spooky sign since we're getting closer to Halloween. The little sign was a gift, and it may be from Saraboo Creek, too. 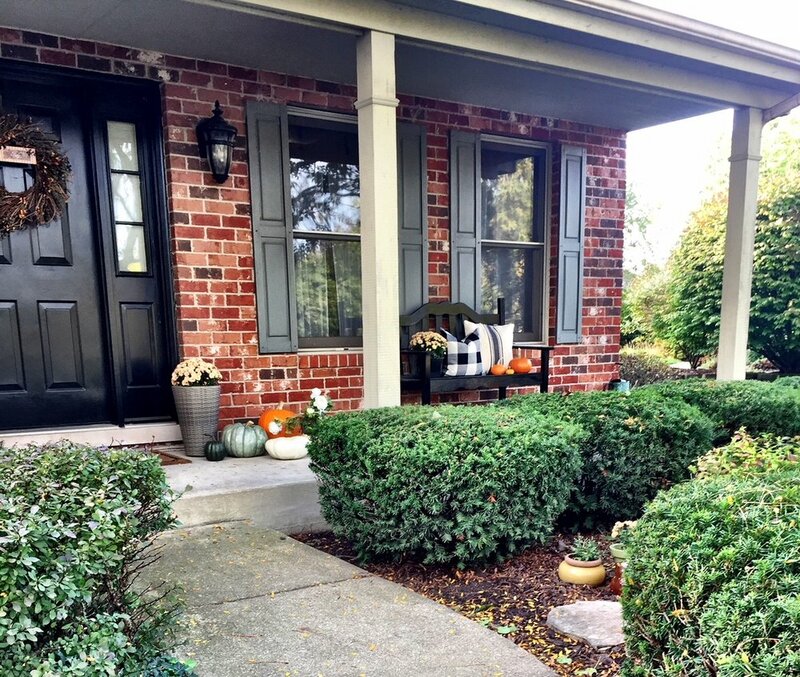 The gray planters on both sides of the front door are a standard for the porch. We keep those out year round and switch-up the plants with the season. I went with light orange mums this year, as they pull in the wreath colors and compliment the brick. I have a dream of pulling off pink mums someday -- maybe next year! We took a trip to our church pumpkin patch last weekend and came back with many, many pumpkins of many, many sizes. I even scored those beautiful fantasy pumpkins on the right. That greenish gray one -- my heart! Love it. We loaded the wooden box on the left with little pumpkins, and it's a sweet little surprise when you walk up to the door. I found that amazing wooden box with the handle at my second home, HomeGoods. I cannot wait to use it throughout the seasons! I've got so many ideas. It's going to be amazing. One more shot because it's my favorite. Another favorite are the pillows on the bench we have tucked to the right. I ordered the plaid pillow cover on Amazon, and you can't beat the price. The other pillow is from, you guessed it, HomeGoods. I added a few little pumpkins and a matching light orange mum. So simple, but what's not to love? It's a sweet little view from the yard, the sidewalk and street! Our last little treasures can be found tucked in the flowerbed just off of the sidewalk. There, two little owl friends are looking all friendly and ready to greet visitors. Aren't they fun? Thanks for taking the outdoor tour! I'm sending sunshine and outdoor fall decor inspo your way! Anyone else loving on their front porch this season? Share your ideas and pics with us!